Wayne shares ways of turning photos and things you find on vacation into artistic treasures. Collecting rocks from the various places you visit on vacation is a great way to preserve memories of your travels. 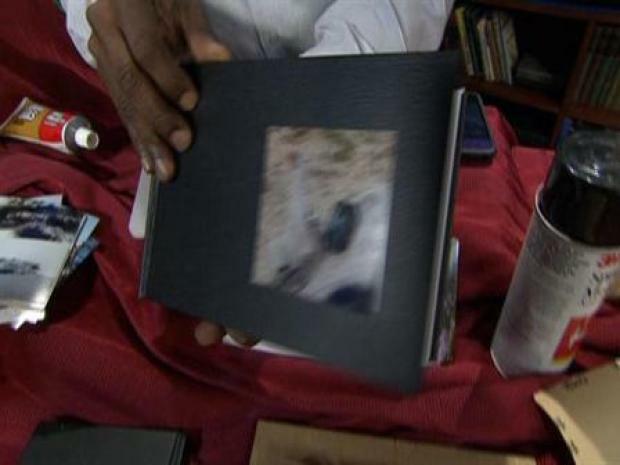 Encasing it in a souvenir cube with a photo of the location from which it was taken makes a nice collectible and conversation piece. I think an important part of a vacation or a special trip is making sure you don’t forget some of the memorable moments after it’s over. Bringing back a memento or taking interesting photos is a great start. But, rather than putting those mementos in a storage box or leaving your photos on a disk or in your camera, take a little time to preserve those memories in more interesting and visible ways. For the last few years, I’ve been collecting interesting rocks during my travels. I think it started when I was on a beach at Monterosso al Mare, one of the cities that make up The Cinque Terre in Italy. I found a pretty cool rock and photographed the view from where I was standing. When I got home, I created a simple display case for it. I found a plastic cube that is normally used for souvenir baseballs and measured the inside width and height of its back side. Based on those dimensions, I cropped the photograph so that it would fit right inside the cube. 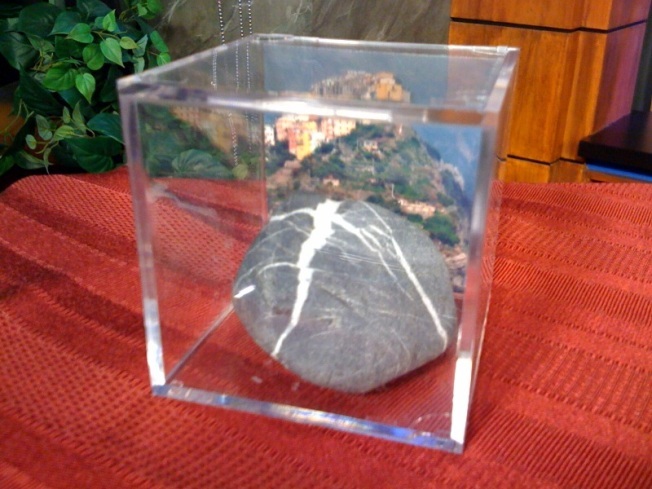 I place the rock into it, closed the cube and I had an instant display case for my memento. Since I decided to start a little collection, I now include a note on the outside back of the cube that details the location and date when I picked up the rock. If you are a parent, this is a fun project to do with your children. Help your kids start a family collection or one of their own. As they get older, you’ll both appreciate the travels you’ve shared and stories behind each of the items in the collection. Creating mementos from your travels is a great way to showcase your vacation for your family and friends. it's also something fun to do with your kids or partner. And, if you're handy with power tools, you'd be surprised with what you can create. I have two friends who are avid hikers in the Palm Springs area. On one of their earlier trips they found a beautiful multicolored stone. Rather than brining it home and starting a collection, they decided to give it a name, take it along on future trips and make it a focal point of their photographs. Every trip they take, they bring the rock, named “PR”, and put him in trees, next to cactus or pinecones, in the snow, and in many other places. The pictures are fun, not only because they feature “PR”, but also because they are usually shot in very cool places during their hike. Rather than putting all of these fun photos in a storage box or leaving them in a photo program on a computer hard drive, I thought the collection would make a nice coffee table book. I asked my friends for a number of “PR” photos and I found a nice journal/sketch book at my local art supply store. Using photo mount, I use one page for each photo and trimmed the images to make room for comments and location notes. The finished book will be an entertaining travel log of “PR’s” adventures around the hiking trails of Southern California. Try something like a “PR” or have your kids bring along a favorite item or stuffed animal to feature in their travel log. Another idea, which requires a bit of handyman skills with power tools, is to create framed artwork using your photos. My friend Larry DeBuhr, who was also part of my Ireland trip, has a Masters in Botany and he loves his plants. During our trip he took a number of photos of the flowers and vegetation in Donegal and Derry. The pictures were so colorful and graphic that I thought it would be great to put them together into some sort of art piece. I took a 3/4" piece of oak and cut it into a number of 2” x 2” squares. Then I selected my favorite images from Larry’s collection and cropped them down to fit on the wood squares. I only used 9 squares (I could have easily used over 100). Once I spray mounted and trimmed the images, I glued them on sheet of 1/4" plywood in a 3 by 3 grid with a 1/2" space between. I then created a frame out of 1/2" oak by cutting grooves for the plywood base and a sheet of 1/8” glass for the cover. The finished piece is pretty cool if I do say so myself. And, it’s a nice floral memento of Larry’s trip to Ireland. Try the same thing with other unique features in the cities you visit, like churches, doors, sculptures, bridges, etc. The bottom line is vacation memories should be preserved, especially those you share with close family and friends. The options are endless. But, hopefully, these ideas will get you started on projects of your own. If you have any questions or comments, send me an email at wayne@waynesweekend.com.